These Indian Spiced Roasted Chickpeas are the ideal healthy snack. If sweets are not your thing and you love your bag of chips or salty roasted nuts, this is a great healthy alternative. They are a great snack on the go or a delicious party nibble. 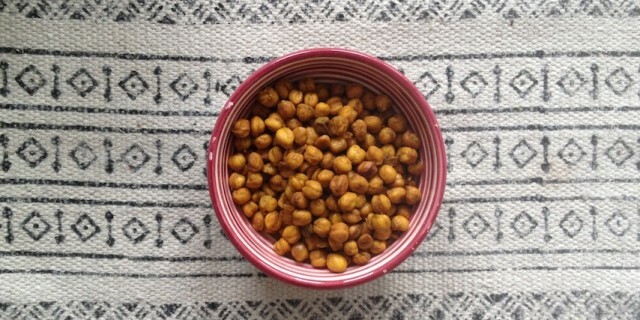 I made these Indian Spiced Roasted Chickpeas for a small catering assignment. They are nice and crunchy and I love how the spices linger in your mouth after eating them. I love cooking with warming Indian spices. My curry blend contained turmeric, mustard seeds, coriander seeds, white pepper, garlic, chili and ginger. I added extra chili because I love a bit of heat. But you can use any seasoning or spice mix you like. These Indian Spiced Roasted Chickpeas are best when you make them using dried chickpeas, as they become crispier, but you can use canned chickpeas instead. Enjoy! Soak the dried chickpeas overnight and throughly rinse the chickpeas. Cook them in plenty of fresh water with the kombu and bay leaf for an hour or until tender. Allow the chickpeas to cool down and then dry them thoroughly with a kitchen towel. Rubbing them dry will help to remove any loose skins. Place the dried chickpeas evenly on a large non-stick baking tray. Mix in the olive oil and one tablespoon of the Indian curry powder and the crushed chilis. For best results place the baking tray on the lowest rack in the oven. Roast for 30-40 minutes or until crisp. Even the insides should be crunchy. I roasted them for about 30-40 minutes and mixed them up every once in a while, and took them out of the oven when they were crunchy on the outside but still a little gooey inside. I allowed them to cool down completely and then roasted them again for 10-15 minutes with 1 teaspoon of ghee. This makes them even crispier. Roast until crispy and even the insides are crisp. I love the added flavour of ghee but feel free to leave this step out if you are dairy-free. When ready, take the chickpeas out of the oven and place the baking tray on a cooling rack. When cooled down, add them to a large air-tight container, mix in the sea salt and curry powder and shake well. Make sure the chickpeas have cooled down completely before you close the lod of the container, otherwise they will lose some of their crispiness. You can keep them for up to two weeks in an air-tight container.